Whether your old water heater is on its last legs, you are remodeling an older house and know a new water heater will be necessary, or you are finishing your basement and adding an extra bathroom, you might be curious about what size water heater you should buy. The most common sizes for conventional water heaters are 75/80 gallon, 50 gallon, 40 gallon, and 30 gallon. Though 75/80 gallon-water heaters may be recommended in certain instances (such as if you have an older home or a large family who all like to take showers at the same time! ), we recommend a power vent 50 gallon heater to almost all of our customers. 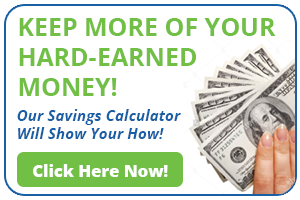 These are less expensive than a 75-gallon water heater and have a very fast recovery. We have many customers who have a 50-gallon heater and never report any issues with running out of hot water (even when there are two people taking a shower at the same time and a dishwasher running). So a good rule of thumb is to figure out what you currently have and assess whether that is meeting your needs, and then consider to what extent those needs will be increased. 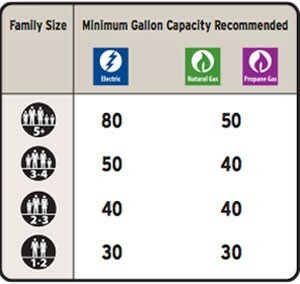 This handy chart from Lowes provides some additional guidance in terms of water heater type and family size when determining what size water heater to buy, though we also like to give customers the caveat that every home and family are different. If you find that you don’t necessarily run out of water, but that it takes a long time for hot water to travel to certain rooms of the house, you can also consider putting in a booster valve. It’s also important to remember that a newer water heater, no matter the size, will not only be more efficient but will also heat up faster, recover faster, and simply work better than an older model as a general rule. So in that sense, replacing an old water heater will almost always be an improvement, even if you stick with the same size. We are happy to discuss any questions you have about the perfect size water heater or other water heater issues. Just contact Dan at 720.876.7166 or dan@sensibleheat.net.